We all knew that iPhone OS 4.0 firmware was going to be unveiled this year, but not as soon as this. Well folks, it is now official and confirmed, they are going to announce it on April 8th, right after the big bang launch of the iPad. All questions will be answered in this upcoming event, which is only a few days from now. It’s the future of the iPhone OS, everything related to apps, multitasking, and all the other major changes that are going to take place will be answered on this day. 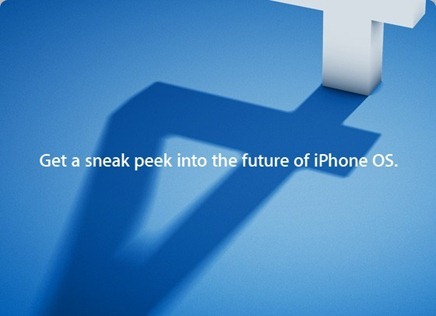 The event will take place at Apple’s One Infinite Loop Campus on 8th April, at 10 AM (PST). We will keep you covered about the event and bring you the latest updates about any major announcements. One thing to note here is that this is only going to be an early sneak peak event, not the actual release of the said OS (firmware). Apple might however release an early beta version of iPhone 4.0 to developers and testers enrolled in the iPhone Developer Standard or Enterprise Program. The final version of iPhone 3.2 for iPhone might also be released at the same event. UPDATE 1: iPhone 4.1 and iPhone 4.0.1 has been spotted in Pinch Media’s Developer Analytics. More info can be found here. UPDATE 2: iPhone 4.0 Event LIVE online coverage links are now up. More info can be found here. UPDATE 3: iPhone OS 4 has been announced. Download iPhone OS 4 Beta Developers Preview for iPhone and iPod touch here. hope it finally has Adobe Flash enabled..
enough with the iphone already…apple has brain washed everyone there are better phones out there..